For me, over the last about two years, my style has really solidified. It’s been in short bursts and has been greatly aided by doing ATCs. I think signing up, having a deadline, picking topics that are both easy and not so easy have pressed my style far ahead of where it has been stuck. There are a couple of big factors that have also contributed to my current art state, but more on those later. I think I can track the changes to this little Halloween piece I did. I have been sketching with Sharpies for many years; they are easy to carry, waterproof, they look good color-wise and they show a nice range on many papers. 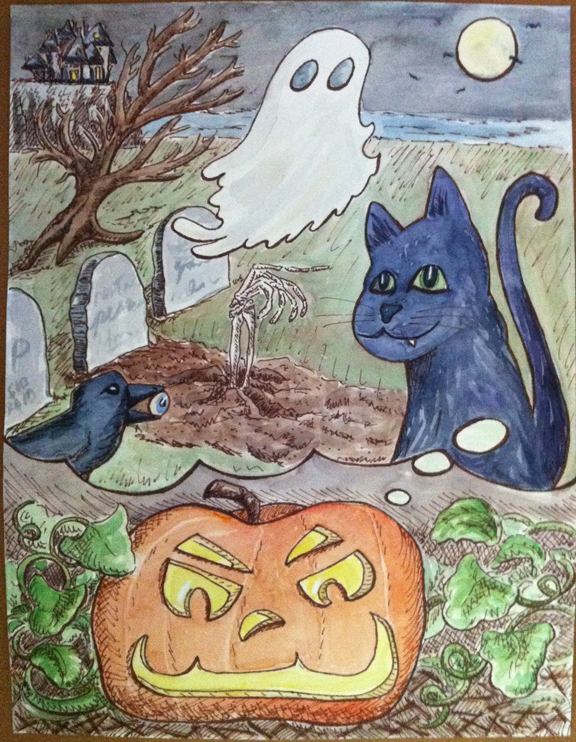 This Halloween piece was the first time I did an illustration in Sharpie instead of acrylic inks. I like acrylic inks and I still use them, but they are messy and not portable. Still, I had a lot to learn in terms of Sharpie use and line weight, which is easier with acrylic ink.